Water hyacinth (Eichhornia crassipes (Mart.) Solms)) is a perennial free-floating aquatic plant species native to the Amazon region of South America. It has become invasive around the world, including the Sacramento-San Joaquin Delta in central California. Water hyacinth can disperse and colonize new locations by floating on the water surface. The intertwined root and leaf structure allows the plants within a mat to remain held loosely together, while occasionally separating into smaller mats (Figure 1). Figure 1. 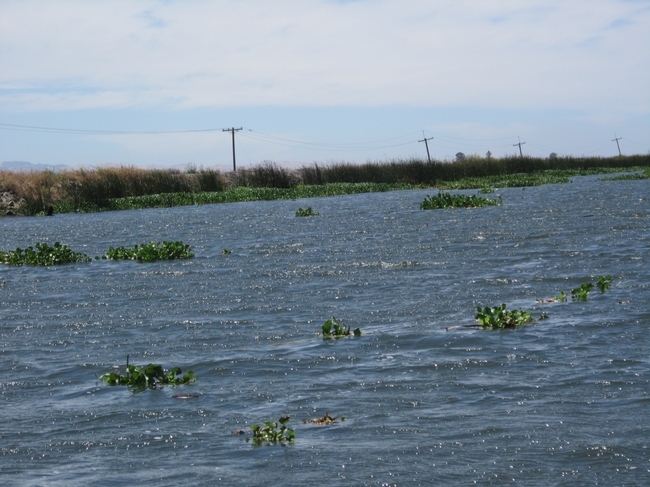 Water hyacinth mats floating in the Sacramento-San Joaquin Delta. Figure 2. Setting up a drogue with radio collar and GPS recording device. The receiver for the radio collar is on the left. 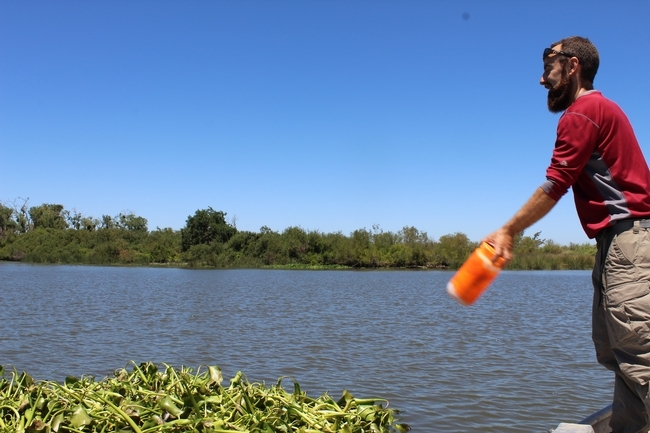 From June 2016 to Feb 2018, a study was done to determine to what extent wind, tidal movement, and water flow from the San Joaquin River drove the dispersal of water hyacinth mats in the Delta. 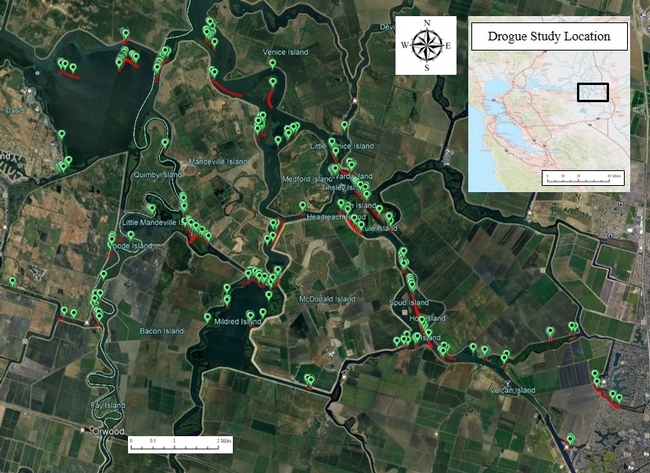 Two-liter Nalgene bottles containing GPS trackers were deployed to track the movement of waterhyacinth mats (Figure 3). 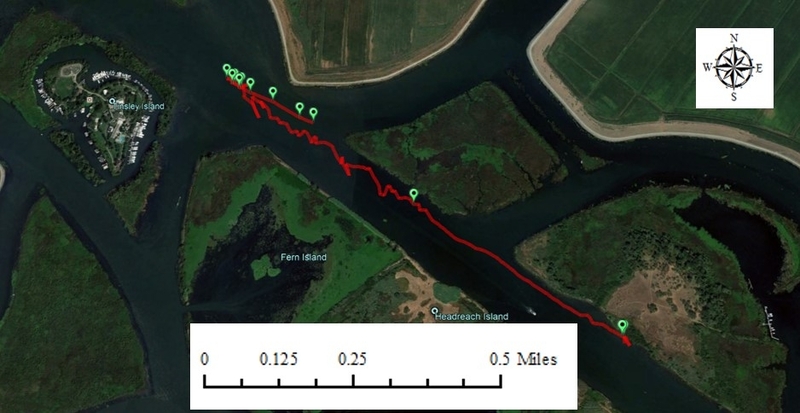 The location, speed, and direction of movement during the time the bottle was drifting was recorded at 15-second intervals on a Trackstick GPS device and downloaded into Trackstick Manager (Figure 2). Figure 3. Deploying a GPS tracker on July 20, 2017. Sacramento-San Joaquin Delta, CA. The water discharge, in ft3/s, was obtained from USGS stream gages located throughout the Delta. The movement of each bottle was compared to the wind and water movement during the period the bottle was deployed. When the direction of the plant mat, water, or wind changed by more than 10°, this segment with a different heading was analyzed as a separate run (Figure 4). Figure 4. All the drift study runs in the Sacramento-San Joaquin Delta, June 2016-February 2018. The red lines show the course that each GPS tracker took and the green points show where they stopped for a period of time. The plant mat direction, recorded as a compass heading, was compared to the direction of the water movement using simple linear regression (SAS 9.4, 2012). The direction of water movement explained a significant proportion of the variance in direction (R2 = 0.8218, F(1, 77) = 355.07, p < .0001), while the direction of wind movement failed to explain a significant proportion of the variance in direction (R2 = .0163, F(1,77) = 1.28, p < .2617). The direction of water movement, including stream flow and tides, had a much greater effect on the direction of water hyacinth mats than the wind does (Figure 5). Figure 5. Fit plot from simple linear regression for water hyacinth plant direction of travel with water movement, in the left graph, and wind movement, in the right graph. Although this area of the Delta is 50 miles inland from the Pacific Ocean, tides have a strong influence on the water there, and plants that are floating in the Delta water. In Figure 6, the plant mat moves with the water to the northwest. Both the flow from the San Joaquin River and the tide are flowing out towards San Pablo Bay. When the tide starts to come in, the plant mat reverses course, heading upstream against the flow of the river. A similar pattern can be seen in Figure 7, with the plant mat changing direction as the flow of water changes direction. The plant mats don't travel long distances in the same direction at once, but move back and forth with the tides, frequently getting caught on the bank. Plant mats become entrained (caught on something) for a period of time, are moved by the water a short distance, then get caught again. Figure 6. An example of a plant mat changing course as the tide changed. 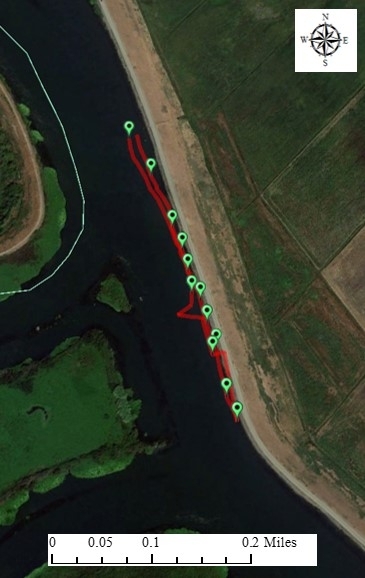 The red line records the track of the GPS in a water hyacinth mat. San Joaquin main channel. November 16, 2017. Figure 7. An example of a plant mat changing course as the tide changed. 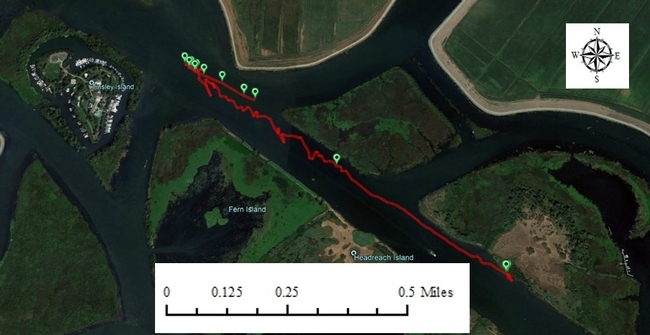 The red line records the track of the GPS in a water hyacinth mat. Next to Mandeville Island, Sacramento-San Joaquin Delta. February 7, 2018. Excellent work and well-written article. This research has important implications for prediction of where water hyacinth populations will accumulate, and these locations can be targeted for control. John has done a great job running with the project over the past couple of years. He presented these results at the Western Society of Weed Science in 2018. This is among the most important research results from the DRAAWP project. Can you post more remote sensing results as well? Where are the contributions from NASA scientists, who are listed as co-director(s) on the DRAAWP. I can't even find a short report from NASA Ames Research Center work under the Products from previous technical meetings? We are waiting on an update for the NASA portion of the project. We also feel that the remote sensing component is interesting and important, and we look forward to posting more information. Very nice field measurements! I'm interested how the GPS 'buoys' were constructed. Can I have a contact to the authors? The device was a 2 liter Nalgene bottle, which was buoyant when sealed. We placed a collar made by Sportdog (https://store.sportdog.com/dog-tracking/tek) in the Nalgene bottle. When we wanted to retrieve the bottle, we used to receiver made by Sportdog, also available at sportdog.com, to locate the floating bottle. In addition, we placed a GPS recorder, made by Trackstick (http://trackstick.com/products/mini/index.html) in the bottle. 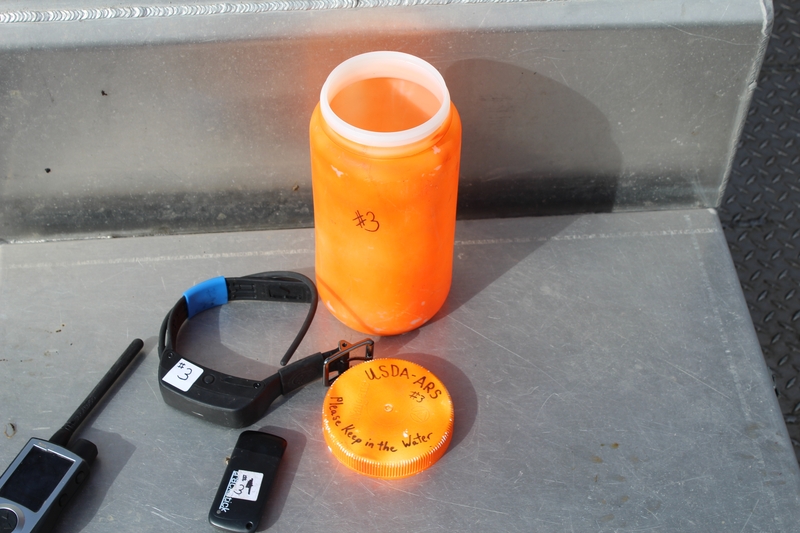 After the bottle was retrieved, we downloaded the data from the Trackstick to a computer. This data could be displayed graphically, as in the Google Maps images in the blog post, or as a table. I hope you are all doing well. I'm settling in (drinking from firehose)in my new appointment at UF/IFAS. We're being tasked with a a small UAS project at Rodman Reservior to map floating plants. I find your methods for deploying GPS drogues exceptionally useful and would like to learn your protocols and see if there are opportunities for collaboration. John I remember your presentation on this at WSWS and put it in my queue to follow up. Hoping I might be able to host a video conference with you all soon. thank you much and have a great day.